William Gidley Godfrey was born in 1846 in Tormoham, Torquay, Devon. He was the son of merchant Abraham Godfrey (1817-1846) and Anne née Gidley (1815-1868). Abraham and Anne had four children, all born in Tormoham; Jane (b1841), Carter (b1842), Mary (b1844) and William. In 1846 Abraham died, age 31, and in the 1851 census Anne was recorded as a widow living at 1 Strand, Tormoham, with her four children. She gave her occupation as a haberdasher and hosier. Anne lived at 1 Strand until her death in 1868. 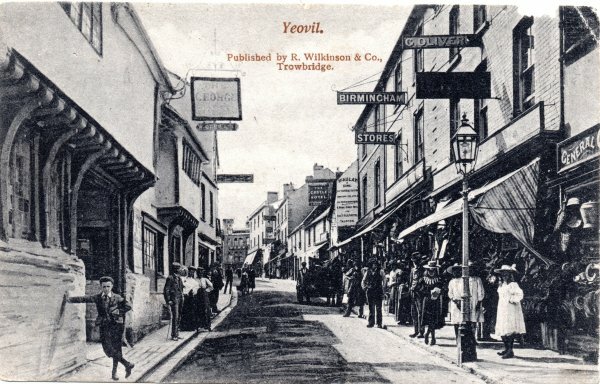 By 1871 William had moved to Yeovil and was working as one of three assistants in the ironmongery of James Bazeley Petter. 25-year old William lived in the accommodation above the shop in the Borough (see Gallery). In the spring of 1875 William married Yeovil-born Anna Aplin (1849-1941) at Yeovil. Anna was the older sister of James Shorland Aplin, founder of Aplin & Barrett of Yeovil. William and Anna were to have four children, all born in Yeovil; Stanley William (1875-1943), Olive Mary (1878-1955), Norman Carter (1881-1918, killed in action on the Ypres Salient) and Cecil Ewart (1890-1954). By the end of 1873, William had set up his own ironmongery business at 9 Middle Street, which was to become known as the Birmingham Stores (see Gallery), presumably since Birmingham was the manufacturing source of much of his wares. The 1881 census listed William and Anna, their two eldest children, two ironmonger's assistants and a general domestic servant living above the shop premises. William gave his occupation simply as an ironmonger. By the time of the following 1891 census, William had moved his family from above the shop, they were now living at 23 Market Street together with an ironmonger's assistant and a general domestic servant. William gave his occupation as and ironmonger and his eldest son, 16-year old Stanley, was an ironmonger's apprentice. The family had moved again by 1901 and the census found the family living in The Avenue. Both William, by now aged 55, and 26-year old Stanley gave their occupations as hardware merchants and 19-year old Norman was employed as a hardware assistant. The Birmingham Stores, 9, Middle Street. The hardware trade is one of the most important of our national industries, and the goods manufactured in Birmingham and Sheffield find their way to every quarter of the globe. The elastic and comprehensive term, 'hardware' comprises not only innumerable articles of general utility, such as iron, tin, and mixed metal goods, but also all the productions of English and foreign potteries, glass ware, and an infinite variety of fancy articles. article. Mr Godfrey has been established nearly 20 years, he personally supervises all details, and invariably manages to afford his customers complete satisfaction. William had a similar listing in the 1895 edition of 'Where to Buy'. By 1901 Stanley had joined his father in the business which was listed in Whitby's Yeovil Almanack Advertiser of 1903 as Godfrey & Son, Ironmongers of 9 Middle Street. Collins' Yeovil Directory of 1907 noted Godfrey & Son as tin workers of Middle Street. In the 1911 census William was a patient in a hospital in Wimbledon. In the column denoting marital status, a note read "Not known - too ill to give information after operation". Nevertheless, William made a recovery and in the Whitby's Yeovil Almanack Advertiser editions of 1911 through to 1918 the firm was referred to as W Godfrey & Sons, Ironmongers of 9 Middle Street, indicating that Norman had joined the family firm. However Norman was killed in action on the Ypres Salient on 16 April 1918, just weeks after his wedding to Georgie Twelves at Christchurch. He was aged 36. It is believed that by 1919 William had retired and his two sons, Stanley and Cecil, took over the business. They also acquired the neighbouring property and in Whitby's Yeovil Almanack Advertiser of 1919 the firm was listed as "Godfrey Bros. Furniture Dealers of 8, 9 Middle Street" and in Kelly's Directory of the same year they were listed as "Godfrey Bros. Ironmongers of 8, 9 Middle Street". There were no further trade directory listings. In 1928 Stanley was living in Thornton Heath, south London, at the time of his second marriage. His marriage certificate states that at the time of his wedding his father was deceased, having died in Keynsham, Somerset, on 6 July 1921, aged 75. Anna died in Weston-super-Mare on 16 April 1941, aged 92. In 1936 it was reported in the London Gazette that "Stanley William Godfrey, Crofton Park, Yeovil, and lately carrying on business at Middle-street, Yeovil under the style of Godfrey Brothers, ironmonger and house furnisher" faced bankruptcy charges and was to attend a Yeovil Court hearing at 12.30pm, 12 November 1936 at the Town Hall, Yeovil. This photograph was taken by Yeovil Photographer Jarratt Beckett and published in his 1897 book "Somerset viewed through a Camera". 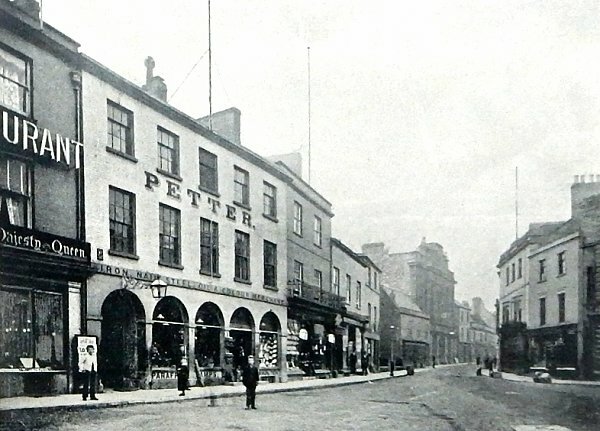 In the very early 1870s William Godfrey worked as an assistant in the ironmongery of James Bazeley Petter, and lived in the accommodation above the shop. William Godfrey had left the employ of James Petter by the time he placed this advertisement in the 26 December 1873 edition of the Western Gazette. This advertisement was placed in the 12 February 1875 edition of the Western Gazette. An advertisement for an apprentice, placed by William Godfrey in the 4 May 1885 edition of the Western Morning News. This advertisement was placed by William in the 29 March 1895 edition of the Western Chronicle. 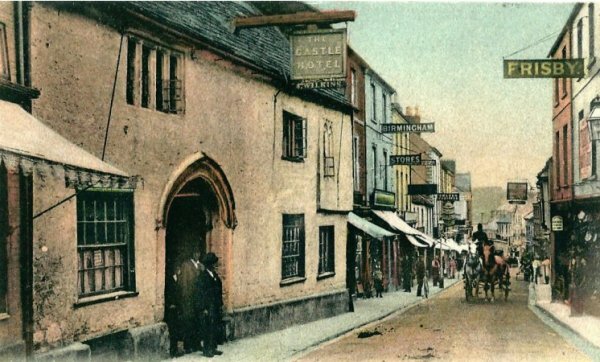 This postcard was posted in 1907 but the photograph was taken in 1896 or 1897 when the landlord of the George Inn was William Cridland and ironmonger William Godfrey was the proprietor of the Birmingham Stores opposite. This hand-coloured postcard was post-marked 1904 but the original photograph actually dates to about 1890 when the licensee was John Wilkins. William Godfrey's 'Birmingham Stores', next door but one to the Castle, is coloured blue. 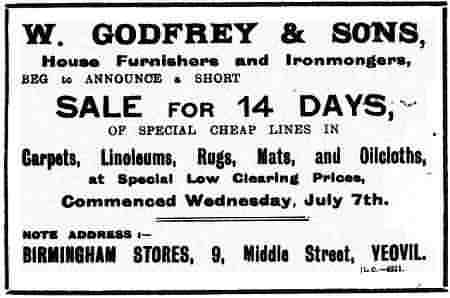 Now W Godfrey & Sons, this advertisement appeared in the 16 July 1915 edition of the Western Chronicle.